You might have heard about Cologne Ehrenfeld. Maybe because of its bars, its vivid nightlife, or the hipster density here. 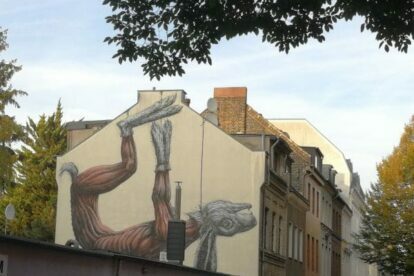 But for me the reason to visit Cologne Ehrenfeld is its street art. There are so many beautiful murals to discover. And, well, why not grab your single-lens reflex camera and join the hipsters to snap those murals? Internationally renowned street artists like Faith47, INTI, M-City or Sepe & Chazme can be seen here, as well as local artists like Huami or Captain Boderline. The best place to start a street art tour in Ehrenfeld is at the Bürgerzentrum Ehrenfeld. Its walls are themselves covered in murals. Then, you can follow the Venloer Straße to the area of the old Helios lighthouse. You find the Stapelbar on your way – the building is artfully painted on its outside. You should also consider having a drink there. Then you can head back towards the Venloer Straße and look at the stunning facade of the houses right around the corner. Make sure not to miss the Bahnhof Ehrenfeld. The train station is painted as one giant surrealistic chess game with a lot of funny chess pieces. But honestly – why follow directions? On the contrary: find your own path through Ehrenfeld, turn left, turn right wherever you want – there is so much art waiting for you to discover. Just keep your eyes open, relax and enjoy.